David has developed a unique style of performing at corporate events over the past decade. From the exclusive setting of the offices of BNP Paribas in Luxembourg, to the vibrant ambience of the Shopping Centre in Norwich, David's magic is always incredibly engaging and highly effective. 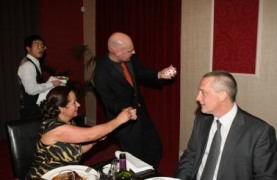 As a magician, David is a world-class performer, but he is equally adept at adapting to the unique requirements of a corporate situation. His knowledge of the corporate environment and immaculate social skills allow him to blend into any situation whilst mesmerising those present with his slick sleight-of hand and mind. 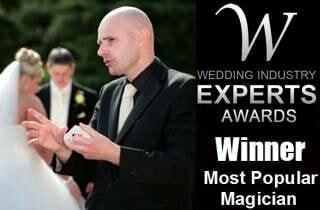 A customised 'Corporate Magic Package' will be created for your own specific business function in Norwich. Be it a trade show, office party or sales event, you can be sure magician David Fox, will leave a great impression of your business on your clients. 1. 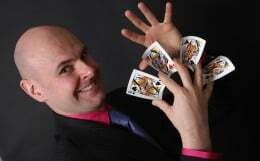 Boost your company's image with an outstanding choice of entertainer. 2. Guarantee that your event will be an overwhelming success with clients and employees alike. 3. Place your trust in an experienced master of magic and reap the rewards of your choice. 4. Clients, colleagues and employees will respect your judgement for hiring the best. 5. With full planning, advice and dedication, your next corporate event will have a cataclysmic impact on the corporate landscape.